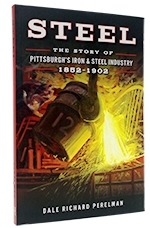 Steel: The Story of Pittsburgh’s Iron & Steel Industry, 1852–1902, portrays the growth of the industry in smoke-filled Pittsburgh during America’s industrial age. It’s the fast-paced saga of millionaire barons Andrew Carnegie, Ben Franklin Jones, Henry Clay Frick, Henry Phipps and Charles Schwab. These strong-willed leaders often plotted and schemed against one another yet united against their underpaid and undervalued pro-union immigrant workforce. Author Dale Richard Perelman recounts this struggle of bloody battles throughout Western Pennsylvania’s plants, mines and railroad yards.